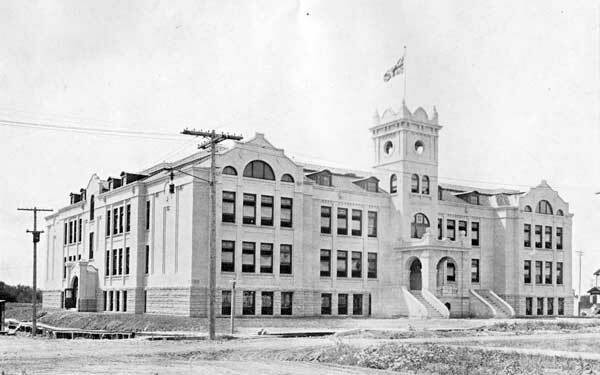 In December 1913, when Mrs. Isaac Cockburn (Laura Secord’s granddaughter) formally opened the ten completed rooms, the school stood among empty market garden fields on the fertile banks of the Assiniboine River, at 960 Wolseley Avenue. The area was largely vacant lots but there was an amusement park called Happyland situated between Garfield and Sherburn. When completed, Laura Secord School was the most modern building of its kind in the city. Twenty-six classrooms, two manual training rooms, a huge auditorium that seats 800, shops, showers and a third floor caretaker suite made it one of the largest schools built during the era. It covered over 25,000 square feet per floor and was 72 feet tall. The school had separate entrances for boys and girls, which continued to be used until the mid-1970s. The similar shading of materials on Laura Secord demonstrates how they age and discolour differently. All the limestone has a dirty appearance because it tends to accumulate pollutants faster than the brick. This is very evident on the foundation and windows sills and is common on many older buildings with limestone elements. While the stone darkens, the brick develops a patina, adding to its lightness. Laura Secord School’s most stunning feature is the baroque entranceway. 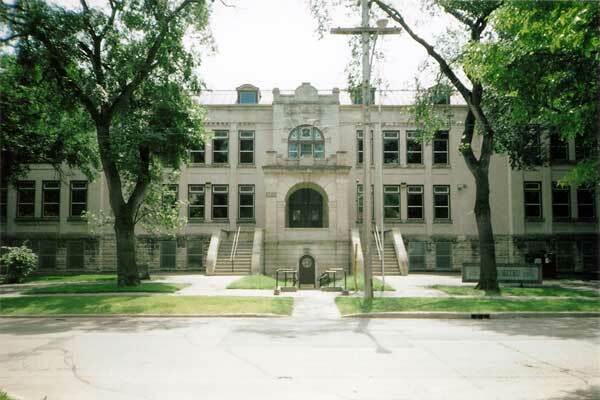 In 1990, the school building was renovated, for which it subsequently received a Heritage Winnipeg Conservation Award. The building is a municipally-designated historic site. Among the school’s illustrious alumni is entertainer Fred Penner who attended in the 1950s. Other noteworthy alumni included F. B. Lamont, J. T. Rodgers, R. H. Tallin, J. C. C. Taylor, and U. S. Wagner. 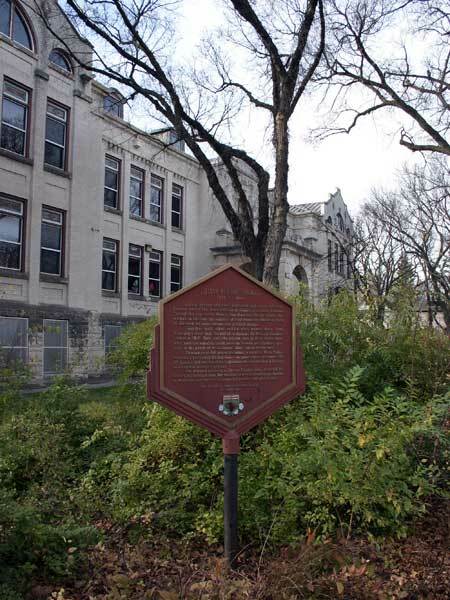 A plaque on the school grounds, erected by the Historic Sites Advisory Board of Manitoba, recognizes the contribution of Lillian Beynon Thomas to the cause of women’s rights and social reform in Canada. In 2014, the building received an Institutional Conservation Award from Heritage Winnipeg for the sympathetic way in which its metal roof was replaced. Elementary Department: L. Cook, B. Coxworth, Agnes L. Florence, M. Lyle, K. S. McLeod, H. Neil, M. A. Parker, R. Parker, M. Pincock, F. Potter, E. L. Randolph, Mrs. Ustick. Intermediate Department: B. Campbell, M. Henders, D. Holtby, J. R. Nicol, R. Ramage, J. Riddell, Marguerite Willard Robertson, E. Sanders, S. Shack, M. Tait, K. Watt, S. Weatherley. Source: Winnipeg School Board, Annual Report 1912, Legislative Library of Manitoba. “Winnipeg schools, No. 26—Laura Secord,” Manitoba Free Press, 15 November 1922, page 5. “School chiefs named,” Winnipeg Free Press, 18 July 1979, page 18. “Laura Secord School receives heritage award,” Winnipeg Free Press, 17 February 1991, NT section, page 13. We thank Barb Unger and Reid Dickie for providing additional information used here.